Here at Homematas, we are Preston’s leading kitchen design experts. We help homeowners and property developers alike, choose the most suitable fitted kitchens to meet their requirements. From traditional and Shaker style kitchens, to the contemporary, we have you covered. But when creating a contemporary kitchen, there are some key design features you might not have thought about. And these could be necessary for the creating a stunning feature. As a result, we have produced this guide to the design elements necessary for contemporary kitchens. Modern appliances- if you want to create a contemporary kitchen, you have to also choose modern appliances to go with the other contemporary elements. This is key to creating a theme for the whole room, and for design clarity. Handleless cabinets- handleless cabinets are a key feature of contemporary kitchens with an emphasis on the simple, sleek and straight edged design. Handles jutting out from the cabinet detract from that quality, and so handleless is definitely the way to go. Glossy surfaces- contemporary kitchens are known for their ultra glossy finish, reflecting light around the room. But actually matt finish contemporary kitchens can be just as stunning. So simply choose the right fit for you and your household. You can even mix and match with a two tonal finish. 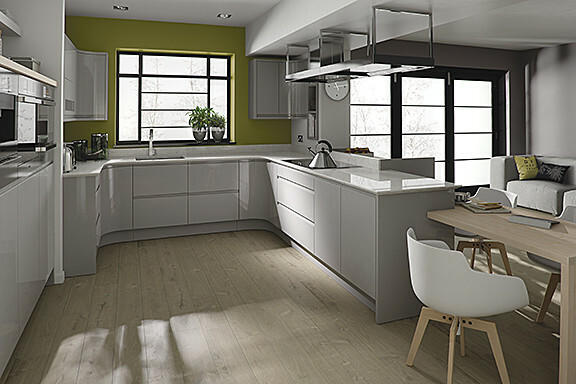 Suitable worktop- There are plenty of worktop choices that could be very effective for a contemporary kitchen. Choose something that will suit your style and colour scheme. For more information or advice, get in touch with the professionals today, here at Homematas. Why should you choose a hardwood kitchen worktop?